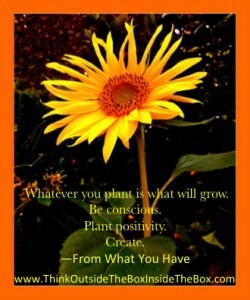 Whatever you plant is what will grow. Ideas, energy, feelings, connections, opportunities—all seeds you plant with every thought, every word, every action, every second of every day. What are you planting? Is it exactly what you want to grow? Is it the seeds of what you want to create? If not, change it! You control what you put in your body, you decide what you say to others, you determine what actions you take out in the world. Consciously plant positive seeds for your health, your mind, your relationships, your career, your financial security and your spirit to grow into the life you want to create. Plant only that which you want to grow. I am planting smiles and positivity. I do see it growing around me and that leaves me smiling even more – what a great cycle! Good, motivating post. I am planting my first screenplay. I started it last year and had a reading and got a bit discouraged withe feedback but have picked it back up again! Way to push through and keep going! Thank you for sharing and planting motivation with your inspiring dedication to what you’re creating!